After the good fishing we had Friday & Saturday, we eagerly headed back south this morning on a 5 hour trip. It started out good with a double on our 7.5 color cores. We had a Super Slim Blue Skinny Jeans on one and a mag size Lemon Ice Dreamweaver on the other. We took a couple small ones, one on a 10 color core and another on an out down set at 60. After that it was a long time until we boated another fish. We worked over the same water we had been fishing Friday & Saturday. The conditions hadn’t changed but the action for us sure did. We boated 3 fish in the last half hour of the trip. 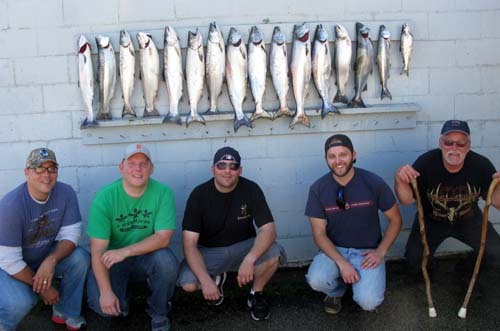 We took Kings on a 250 copper with an 8″ Chrome Mountain Dew NBK Spin Doctor/Black UV Big Water Meat Rig and a 10″ Chrome Killer Spin Doctor/Green UV Big Water Rig out 180 on a high wire diver. We hit 2 Steelhead on 3 color cores but only hooked up 1 of them. It turned out not too bad for a half day fishing. I don’t have any more trips scheduled, but will be open for charters for the first two weeks October. We fished south again today setting up in the same area as yesterday. It started out a little slow, but the action picked up and lasted to about 9:30. We had a lull until 11:30 then it picked back up again. We definitely had a couple of hot rods today. 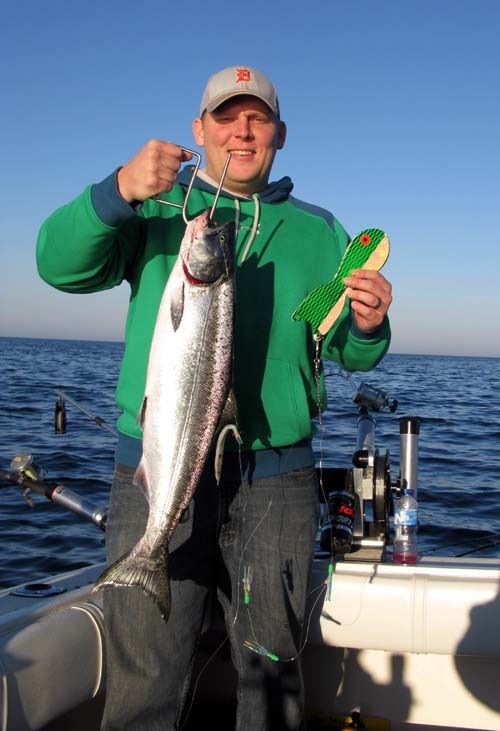 A 10″ Chrome killer Spin Doctor/Green UV Big Water Meat Rig, pictured below, out 120 on a high wire diver went 5 times. Our second best rod was a 10 color core with a regular size Dreamweaver EVM spoon. It took 4 fish. A Super Slim Starburst on a 3 color took 2 Steelhead. 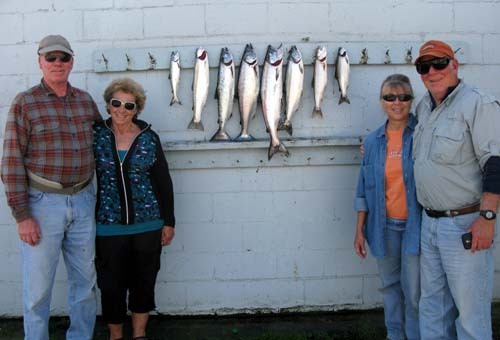 We also took fish on 5, 7.5 cores and 1 King on a 200 copper. A pair of regular Fuzzy Bear Yellowtails set at 50 on an out down went a couple times. Our chute rigger down 85 with a 10″ Green Sparkle Spin Doctor/Green Gasoline Dreamweaver Meat Rig took our biggest fish today. The water was warmer today than yesterday so we had some of rigs down deeper then yesterday and it paid off later in the day. We were fishing between 80 & 130 feet of water.